An awful lot of videogame Kickstarters get shuffled our way, as you might imagine, but only a select few really grab us. 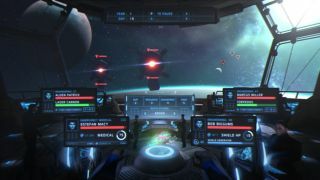 Into the Stars is one of them: It reminds me a bit of the ancient EA classic Starflight, for one thing, and Into The Stars is also being developed by a team headed by veterans from Battlefield, Medal of Honor, Earth Defense Force, and Shadows of the Damned. Even better, the soundtrack is being created by Jack Wall, the composer who wrote the music for Mass Effect. Into the Stars begins with Earth about to collapse under the weight of a decade-long alien onslaught. As captain of the Ark 13, it's your job to outfit the last of humanity's escape vessels with modules, cargo, and crew members, and lead it to a new home among the stars, ahead of the pursuing enemy. FTL and Oregon Trail are big influences, and on the thematic side of the coin there's obviously a good dose of Battlestar Galactica in there as well. The project is being developed by Fugitive Games, a new studio founded by Ben Jones, Alden Filion, Roy Orr, and Marc Janas. It's already undergone "significant development," but now the team is looking for $85,000 to wrap things up. The usual sorts of reward tiers are up for grabs, but there's no indication of stretch goals yet—those will presumably come later. The "risks and challenges" section of the Kickstarter is also very vague: "Even with your support, our veteran team and the rock solid Unreal Engine 4, things can still go wrong," it says, without expanding on what some of those things might be. Which makes this a good time to segue into the warning that Kickstarters are inherently risky business, and even though I think Into the Stars looks fantastic, you pays your dime, and you takes your chances. The Into the Stars Kickstarter runs until February 4. More info about the game and the guys making it is up at fugitive-games.com, and you can also give it some love, if you're so inclined, on Steam Greenlight.